I've been a long time fan of Julie Kagawa and honestly I'm pretty disappointed by this. I was expecting something amazing, especially because I loved her Blood of Eden series. If you want to see Kagawa at her finest I'd skip Talon and read The Immortal Rules. Now, this book wasn't terrible by any means. It was just so freaking predictable that the fun and intrigue was sucked out of it. If I already know how the book will end from the first couple of chapters, there's a problem. The entire story had been done many times before, even with the exact same concept of a dragon and a dragon hunter falling in love. I thought I was going to get a fresh new take on that story, but all I got was the feeling that I'd already read this before. I expected a lot more about dragons, considering this book is about a girl than can transform into a dragon, but the majority of the book was spent with all the dragons in human form. 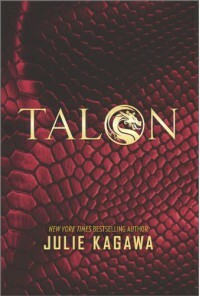 I found this very disappointing and if not for the occasional mention of flying and Talon, then you could probably forget that the main character was a dragon because she was hardly ever actually a dragon. A weird thing that I'm a little confused about was that Ember kept referring to the dragon part of her as her dragon and not herself. It was odd because she literally is the dragon, but she made it sound like the dragon part of her was a separate personality. The romance was ok, if you can get past the insta love. I'm pretty sure, but not entirely positive that Garret and Ember's relationship develops over like one or two weeks, which made their whole situation a little unbelievable. I'm also not entirely sure if there's a love triangle. Not only was Garret and Ember's relationship predictable, but also the behavior of Ember's twin, Dante, was predictable. He is literally the stereotypical perfect, rule following older sibling, while Ember is the unpredictable, rule breaking sibling. As you can see my main problem with this book was that everything was predictable and nothing seemed to really stand out to me. It wasn't a bad book and there were definitely some parts I enjoyed, but this definitely isn't my favorite. I may continue the series because I love the author's other books so much, but I definitely won't have high hopes, like I did for this book.